First of all, Nathan Bishop at Lookout Landing wrote a fantastic Thanksgiving post here. It is, like any sort of humor on a very specific topic, far more funny if you’re familiar with the members of the team and their skills and personality makeup, but I am, so it’s hilarious. I often wish I was half as talented or prolific as the good writers at Lookout Landing. May they all have a good holiday, and not feel the need to do squats. Also, hopefully James Paxton will finally get some pie. I know Nathan is likely already on beer duty. I just realized that I waited so long to comment on an article from the Seattle Times about Brad Miller’s transition from shortstop to outfielder, I no longer have to comment on it. The Mariners acquired Leonys Martin and Anthony Bass in a trade with Texas that sent Tom Wilhelmsen and James Jones and a PTBNL (grab bag player!) to the Rangers. I can say more about one side of this than I can the other. I don’t know Leonys Martin or Anthony Bass. I literally just read this post about the trade, and it doesn’t necessarily engender confidence. OK, great, Jerry Dipoto found a guy whose contract we don’t have to deal with on the cheap. A 27 year old guy with injury problems; I’m not convinced anyone would have to pay high for that, so this doesn’t feel like much of a feat, but I could be wrong, and I hope I am. The second thing he found was a right handed pitcher who had 33 relief appearances last year, and allowed 32 runs over the course of 64 innings. He struck out 45 batters, which is great and all, but .500 in runs/innings doesn’t seem like a place the Mariners really want to be. Anyway, Martin is a center fielder who is apparently very aggressive about it, and that is great, rah rah defense; but our problem is still hitting, and it will continue to be hitting until it’s not anymore. 2014 seems to have been Martin’s best year in his short major league career, so if he can return to that, then great. But Martin’s injuries are in his hands. And hands are important for baseball. Sort your hands, Leonys. We need them. He is projected by Steamer to have a 1.2 WAR in 2016, so if he can further take care of that wrist and stay away from basketball, gymnastics, and mountain climbing during the offseason, maybe this isn’t as bad as I’m feeling about it right now. James Jones had flashy moments of flashy brilliance, and he was fun to watch steal bases because opposing teams never seemed to be expecting it, even if they surely had to have known he was going to do it; but Nathan is right in the link above; he just wasn’t delivering offensively, and that’s a problem with the manager keeps sticking you in the leadoff spot after a draught in team production in the early middle of the season has caused a severe nosedive towards any sort of playoff possibilities. I do hope he does well for himself; like Nathan said, he is fun to root for, and it would have been easy to nickname James “The Flash” Jones. You’re welcome, all other teams Jones might be on. Don’t say I never gave you anything. But Tom Wilhelmsen. I was going to say what can anyone say that hasn’t already been said about Tom Wilhelmsen, but then I realized; there is nothing to say, because there is no need to say it. Any Mariners fan knows Wilhelmsen’s skill and character. He was one of a small group of players to consistently show up to FanFest and sit in the cold outside – usually proudly walking up to the Dugout Dialogue with Turn Down for What blaring over the PA, and wearing a beard hat – and take questions from fans until he ran out of time. He hung out with fans at the Ms social media booth; several people I’m acquainted with had their pictures taken with him, and it always looked like he was the one holding the camera. He made faces, he laughed and joked with people, he signed autographs for just about anyone while he was here, he danced like a fiend (and will do it for an audience at the drop of a hat), and if there was ever such a thing as a player I regret not getting an autograph from or trying to talk to, it’s him. In the short time I’ve been a baseball fan, there have been a lot of players come and gone through Seattle while we try and find our winning combination, but Tommy was and is special. He didn’t hide from fans, he seemed to welcome them. He wasn’t a big money guy. He was always in the yearly commercials (and his and Charlie Furbush’s friendship, whether manufactured or not, was amazing). He seemed down for anything and everything in and surrounding the game of baseball. And when it came time to get out on the mound and throw, he threw. He threw fast, and he threw hard, and he threw filthy. And then he’d high five Mike Zunino or Jesus Sucre, or John Jaso, or whomever else, and then he’d dance some more before signing more autographs. He’s been a steadfast fixture in the Mariners bullpen for a while now, and helped the trend in the team towards wearing high socks (a trend that I think those of us who now own pairs of those high socks appreciate). But most of all, he was real. And that is why I will miss him. I want to say they’ll never love you like we do in Texas, Tommy, but I hope I’m wrong. Go get ’em. We’re gonna miss you like hell. 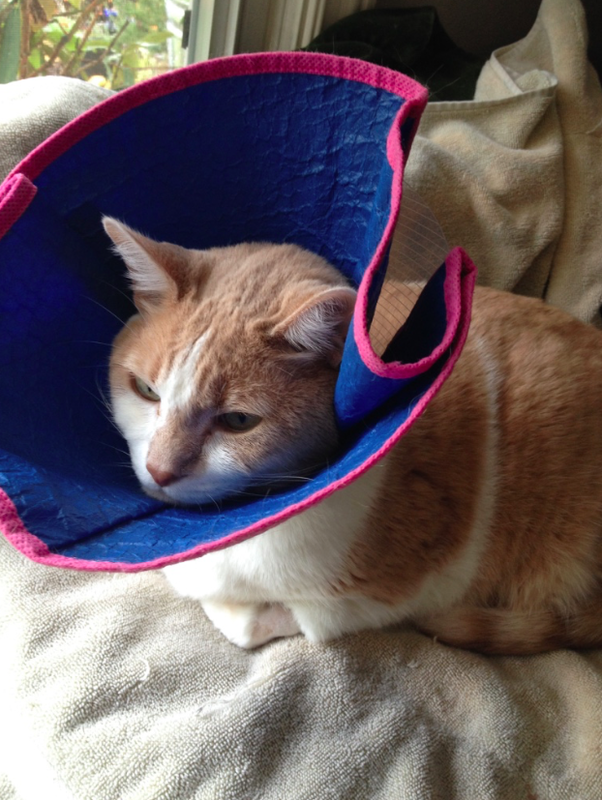 Lastly, my long national nightmare is slowly coming to an end, in that JJ T Putz, my fat orange cat, came swimmingly out of surgery two weekends ago, and has been having a good recovery. His shame helmet comes off next Tuesday, and the surgical site looks good and has been looking better day by day. He will live a long happy life, and maybe that, above all else, is what I have to be thankful for today. Happy Thanksgiving to those of you who celebrate it, and happy Thursday to those who don’t or can’t. Cheers, everyone! Winter meetings are coming! I like what you had to say about Wilhelmsen. I’m actually more excited about him now. As for Bass and Martin. I didn’t mind either of them, but I wasn’t attached to them either. My problem with Leonys really came in the postseason. He was so mad about being left off the ALDS roster that when the team told him to go to Arizona to work on some stuff, he flat out just refused and didn’t show up. I don’t like guys with that kind of attitude. No matter what their talent level. Ew. That doesn’t exactly create much confidence for me, either. I know that the organization talked Logan Morrison out of Tweeting his no-homo nonsense, so maybe they can talk some sense into Martin. I don’t know how Dipoto runs things, but hopefully he doesn’t take any Bs from guys like that.